For the fans of Portal, Portal 2 and Half-Life 2, this minimalistic logo of Aperture Science Inc. is a perfect tattoo idea. Eight triangles comprise a circle with an octagon of free space in the middle. 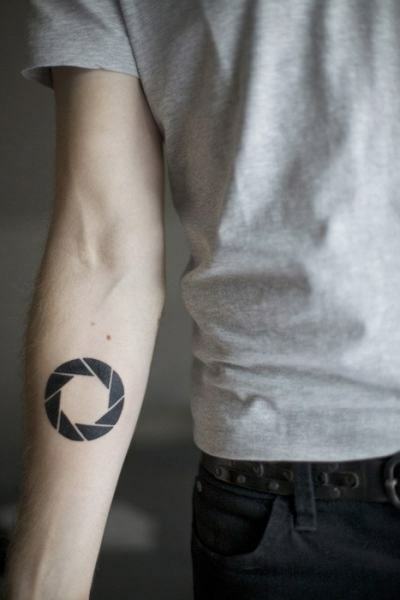 Aperture Science logo is sharp and clean forearm tattoo. These colorful sleeves are a mix of the classic arcade games of the 90’s: Sonic the Hedgehog, Super Mario and Legend of Zelda. With two Triforces on the bottom, a determined Sonic in the middle and a Mario background – you can’t really miss, can you? This sleeve offers a true mix of all the arcade games from the 90’s. Donkey Kong, Link, Mario are just some of the characters that are found here. 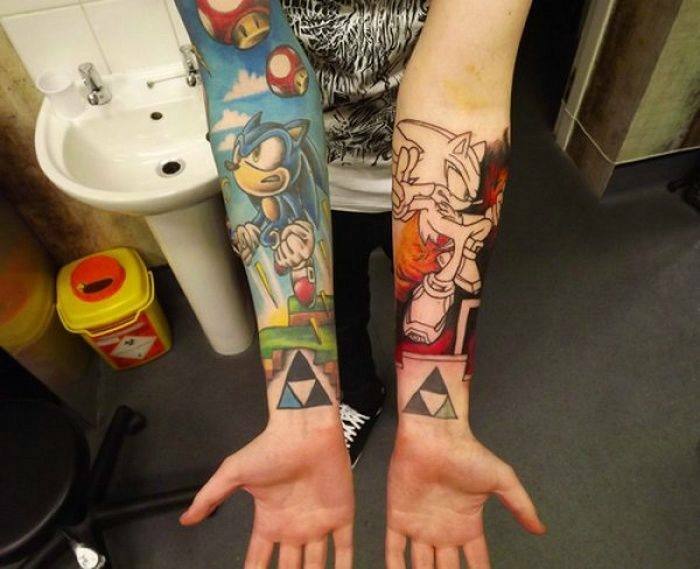 Devoted gamers will love a tattoo idea that brings up all their fond memories. 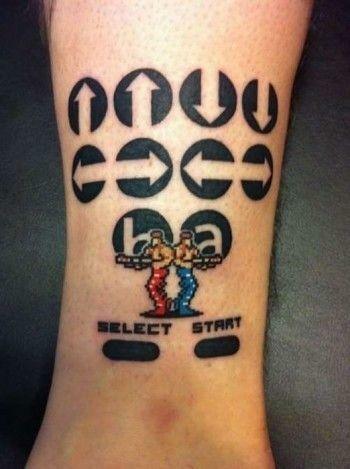 The Konami Code is a genius tattoo idea that will bring out a smile in every Konami games aficionado. It was initially used in the Gradius game and has appeared in many games and apps ever since. 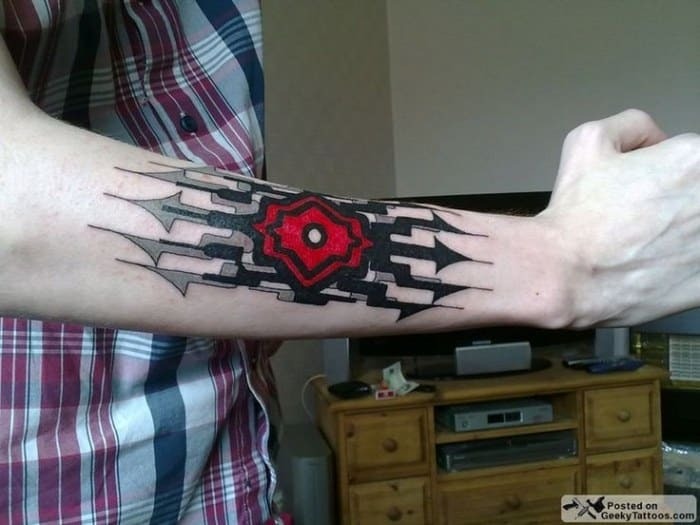 Only true gamers will recognize this tattoo. 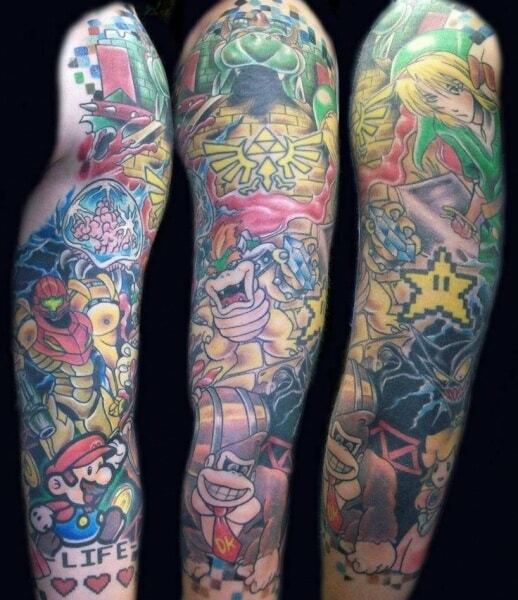 Super Mario enthusiasts will enjoy this colorful sleeve of their favorite arcade game. It involves Mario, Super Star, Boo, Bullet Bill and other iconic characters. 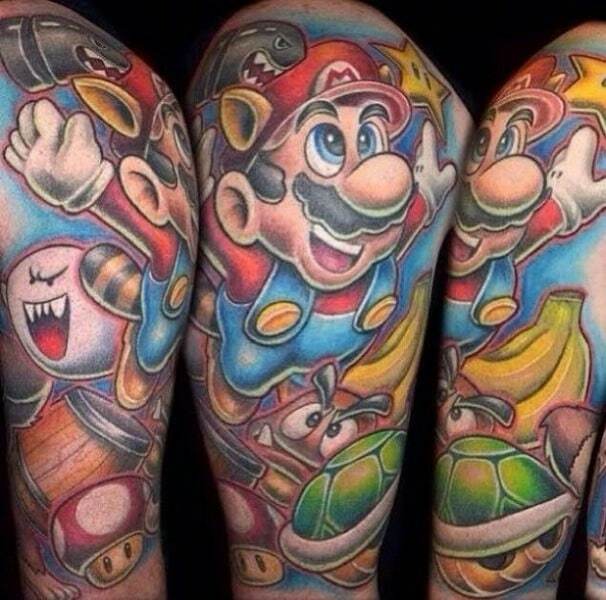 If you’re looking for the best Super Mario sleeve, then this vibrant sleeve is an excellent choice. Two distinct portal ends blue and orange created by the game’s protagonist, Chell, is seen on each person’s side of the abdomen. It’s perfect as a couple’s tattoo for portals pave the way to a visual and physical connection between two locations. 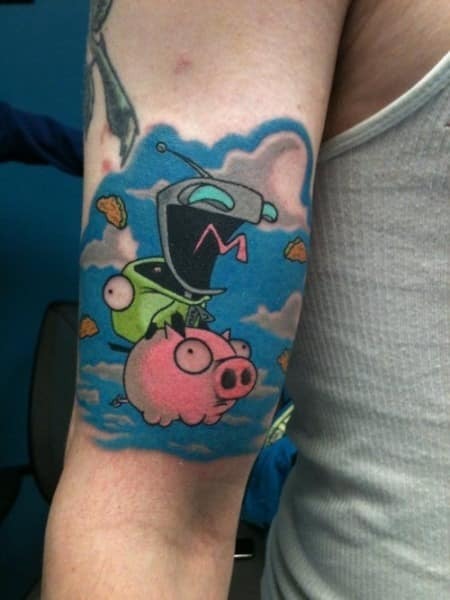 Invader Zim fans will “loved-ed” this gamer tattoo featuring the extraterrestrial from planet Irk riding and taking over Gir’s cute pink pet piggy! Their colorful universe is portrayed in the airy backdrop of blue skies and white clouds, altogether creating an attractive design. Underneath the skin’s layer is the arm of a Marvel superhero who was once bitten by a radioactive spider. 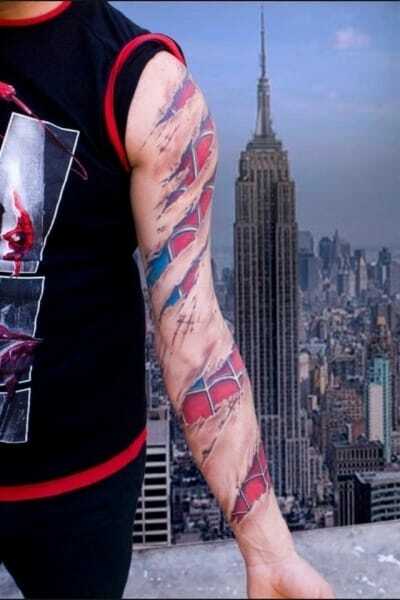 The classic Spiderman’s red and blue webbed costume is unmistakable in this awesome tattoo that’s intricately inked throughout the arm’s length. Marked on the arm is the brand of I’Cie in its final stage from the hit Final Fantasy XIII title. Bright red makes a striking centerpiece while strong and crisp black lines enhance the distinctive pattern of this Final Fantasy Tattoo. 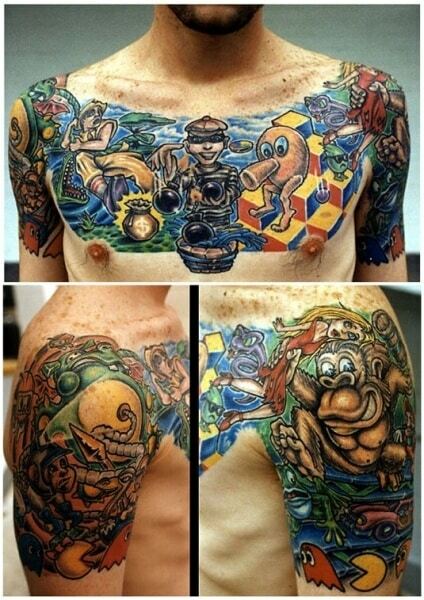 The chest and half sleeve are covered all throughout in this elaborate gamer tattoo design. Various arcade game characters make up the spectacular image, such as the cute orange critter Q*bert standing and jumping about on colorful squares, and a whole lot more.